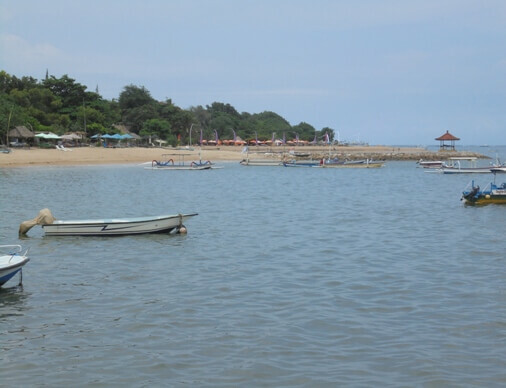 Mertasari Beach Sanur Bali - Lovely Beach and Peaceful Environment! Mertasari Beach has beautiful white sands, magnificent ocean views, and is surrounded by shady and peaceful surroundings. 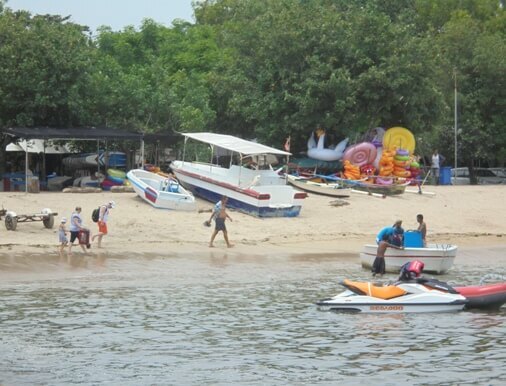 The beach is located at the southern tip of Sanur Village, a coastal area with rapid development in recent years. To the east, visitors can enjoy views of Bali's mountains and idyllic sunrise. The view of port activities and Serangan Island in the south. While in the west you can enjoy a romantic sunset with hedge of mangrove forest. The beach is easily accessible by car. The distance is about 15 km from Ngurah Rai International Airport, a 30 minute ride in normal traffic. You can take a route to Sanur area via the Bali Mandara Toll Road. Then grab the Jl. Pengembak and continue to the Jl. Mertasari Beach Street Walk and you have found it. At certain times, a few days before Nyepi Day, Balinese will hold the Melasti Ceremony here. They bring several sacred objects from the temple, such as: statues, pratima, spears (tombak), kober, lelontek, payung pagut, and more, to be purified. Surrounding the beach, there are several temples (holy shrine) such as: Pura Mertasari, Pura Dalem Pengembak, and others. Many visitors come for the purpose of purification ritual or "melukat". This beach is recommended for lovers of spiritual. The beach is sheltered by canopy trees, bringing a shady and cool atmosphere. This place has extensive parking lots, local warungs (food stalls) and many souvenir shops. 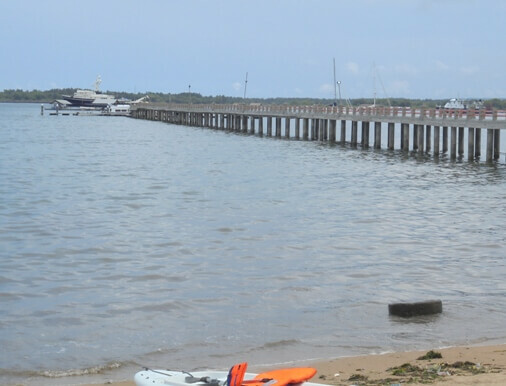 There is also a pedestrian path to explore interesting sights and spots such as: the traditional bale and wave retaining, traditional fishing boats, jetty, port view, and more. This is a favorite beach for locals. In holidays and weekends are always crowded. Visitors can try some water activities such as canoeing, kite surfing, stand-up paddle board and other water sport. You can also do more relaxed activities such as sunbathing, swimming and soaking, bike ride along the pedestrian, and also visit the Dream Island Mertasari. The beach is also the venue for the Mertasari Beach Festival and the Bali Kite Festival. The Mertasari Beach Festival is enlivened with some interesting and fun activities, such as: jukung race, yoga, beach cleaning, live music, fireworks and more. This beach became one of the locations (in addition to Padang Galak Beach) for the Bali Kite Festival. The event was followed by participants from various countries, such as: Netherlands, America, France, Japan, Indonesia, and more. The sky over the beach becomes lively and colorful as the participants played their kite with variations of models, colors and shapes. The beach also becomes a magnet for the surfers, due to the shore-break in front of the beach, featured by the big, fast and powerful waves. This spot is recommended for intermediate and professional surfers. The beach is also close to several famous surf spots, such as: Serangan Beach, Sindu Beach, Segara Beach, Sanur, Matahari Terbit, and Padang Galak Beach.